​What are Chipmunks and what do they do? Chipmunks are the pre-k age siblings of older scouts who play, explore and learn new outdoor skills from caregiver volunteers or they may tag-along with their Otter-aged siblings. Chipmunks must be directly supervised by at least 1 caregiver. On my chipmunk honor, I promise to do my best. The Chipmunk explores the world. 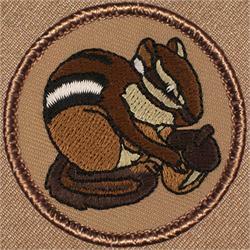 ​Chipmunks have their own scout sign: Right hand by right cheek, fingers folded over into a palm.